A leadership training programme devised and delivered by a team in Surrey is improving patient care and boosting the morale of district nurses. The District Nurse Development Programme at Virgin Care’s Surrey adult community nursing service has enabled participants to develop leadership skills and empowered them to champion quality, compassionate, patient-centred services. RCNi Nurse Awards 2016 Leadership Award winners Ruth McCarthy, Kim Geraghty and Tracy Harman. Virgin Care launched a community nursing innovation programme to improve its services after clinical lead for professional development Tracy Harman and her team decided they had to address the considerable challenges facing them. These included internal changes such as the drive to implement new mobile clinical management technology to the pressures of the constantly evolving role for district nurses. The programme was devised by Tracy, a district nurse and practice teacher, and supported by Ruth McCarthy and Kim Geraghty. The team was last month named winner of the Leadership category at the RCNi Nurse Awards, one of nursing’s top accolades. Leadership training was seen as especially important for district nurses as the isolation and daily workload mean there is much less opportunity for reflection and peer support. ‘There are so many barriers to supervision in the community,’ Tracy says. ‘District nurses are spread out and work autonomously. There is a huge amount of complex care but our nurses have to grow and develop on their own. Nurturing and developing nurses is where my heart lies. I’ve been there, I know how it feels,’ she adds, having been a community staff nurse for ten years before becoming a district nurse 14 years ago. ‘There was a gap between theory and practice, and I wanted to give our nurses the skills to bridge it. A brainstorming session with Kim established repeat themes around professional development that later became module headings: visions, values, roles and responsibilities, leadership behaviours and managing people, driving improvement and handling challenges. These were linked into the NMC Code. The team used existing resources; the four clinical leads were module leads and internal experts were drafted in for specific subjects. The four modules were delivered to four cohorts in four months at a cost of £100 per head. All practice teachers, district nurses and senior community nurses at Band 6 or 7 took part and received a certificate for revalidation at the end. Modules were evaluated and feedback used to improve them for the next cohort. In an online questionnaire, nurses rated their competence and confidence. The percentage of participants’ who scored themselves four out of five on a range of learning objectives were compared before and after the course. These scores improved from 11% to 89% in handling complaints, from 25% to 91% in handling challenging behaviours, from 18% to 92% in awareness of key human resources policies, and from 34% to 98% in awareness of vision and objectives for the district nursing service. Budget was made available so bank nurses covered shifts to enable others to take part. District nurse team leader and practice teacher Bethan Garner found it helped her as a manager and in supporting new district nurses through their qualification. ‘I covered leadership in my district nurse training and in my practice teacher course, but this was a while ago,’ she says. Ms Garner says senior nurses are now even more aware they are role models who set the standard: ‘By having the opportunity to take time out of our daily practice to work with and reflect with colleagues, we can now lead our teams more effectively. 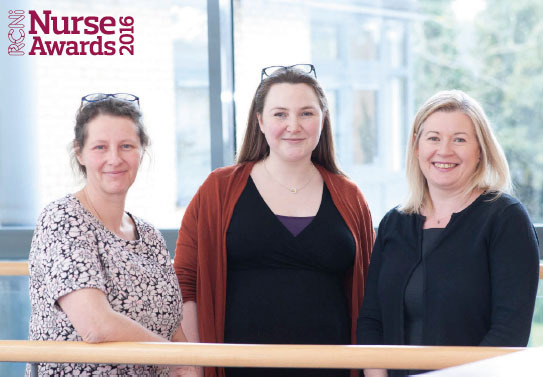 The RCNi Nurse Awards judges thought the development programme had national and international potential and praised the team’s energy and commitment. Course participants helped create a book of service standards called The Boss and the team has also developed the Passport to Practice six-month preceptorship. Victoria drove forward a new holistic service giving better access for cancer patients to palliative care. The North Manchester Macmillan Palliative Care Support Service co-ordinates care with district nurses to improve communication and share knowledge for patients in their last year of life. Ann devised a nurse development pathway to try to address difficulties in recruiting clinical nurse specialists to child and adolescent mental health services. It offers Band 5 and 6 mental health nurses interested in working with children and young people a tailored development package. Nurses hold a caseload in size and complexity appropriate to their experience. A two-week audit showed that 26% of patients on the cardiothoracic intensive care unit had delirium, but 66% were undiagnosed. Team leader Siby Sikhomi researched the evidence then embedded a new validated screening tool called confusion assessment method for ICU (CAM-ICU) into daily practice to improve patient care. The Delirium Care Group then delivered training. Gloria transformed the maternity department at James Paget University Hospital in Norfolk in her previous role. Staff morale was low and sickness rates high, while the service for mothers and babies needed improvement. Gloria improved safety, ensured service user feedback was collected and developed effective arrangements for vulnerable women. The service is now rated ‘good’.